For the past 127 years, Half Moon Bay boasts a place of worship that has the highest cathedral roof in the world. As a bay in Bostwick Island, there is of course no roof at all, open to the heavens, as it were. 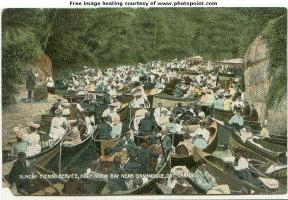 The story goes that one long ago summer day, a boating party was caught out on the river in one of those fierce and sudden squalls that can sweep through the islands. Apparently thankful and inspired by the fortunate refuge in the bay, the idea for the an open-air church was born. The bay’s name comes from its crescent shape; a small glacier-carved fiord rounded and polished by those abrasive rivers of ice over millions of years. 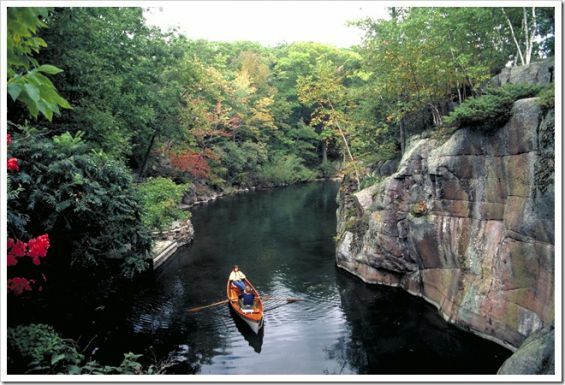 The steep slopes of the north shore are richly forested with a tapestry of shady, overhanging basswoods, maples, ash and hemlock trees. It is tranquil in the bay, regardless of the tempests that may rage outside, be they those of Nature or world events. 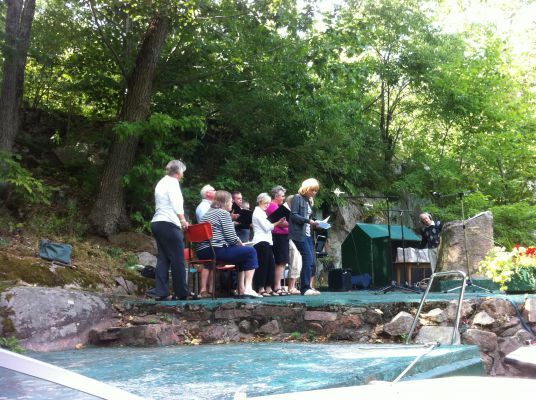 Before the appointed afternoon hour arrives, boaters idle and paddle into the bay gathering in front of the rough granite block pulpit, gently interlocking, puzzle-like. 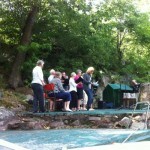 A pianist, and sometimes a choir, share the space on the granite block. In days past, the preacher’s voice rang out across the rafted congregation, but today microphones carry gentler voices. 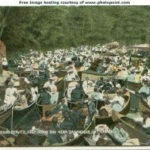 Hymnbooks and a donation basket are passed from boat to boat. It’s a casual affair, the various denominations taking turns throughout the July and August services. Is there a special religious event that you would like to celebrate in a place that is Amazing? Half Moon Bay is available for Christenings, Weddings and Memorial Services. Please direct enquiries to 613-530-3523 or 613-382-4015. You can also email your request to Half Moon Bay Foundation. Please note, guests requiring the use of a sound system will be required to provide their own. 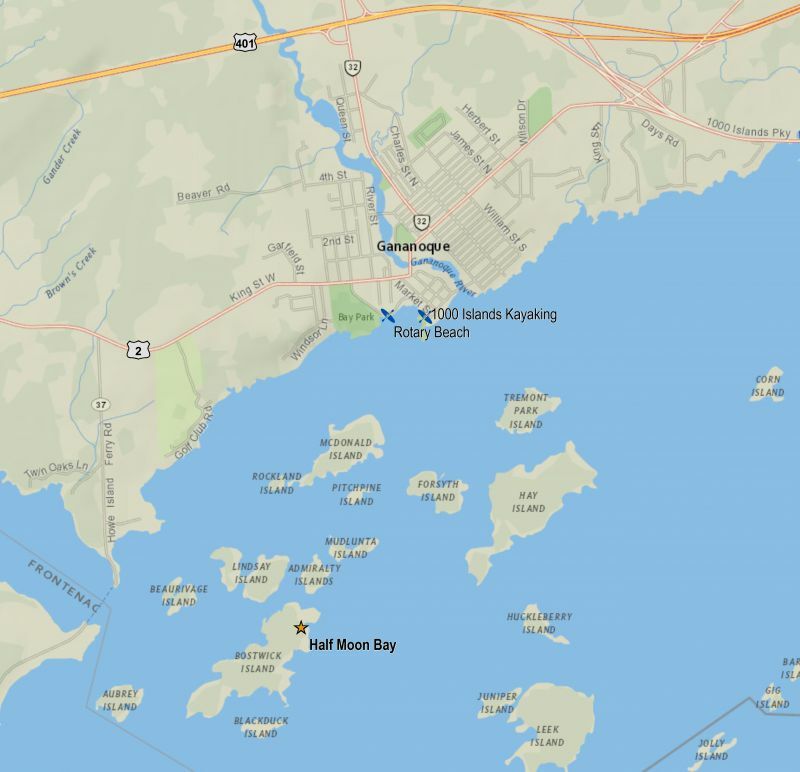 Paddling: The closest access points (as shown on the map below), drive to Gananoque and launch a kayak or canoe at Rotary Beach (accessed from Bay Road), or 1000 Islands Kayaking (110 Kate Street). The Admiralty Islands are a fantastic place to paddle. Click here for a paddling route, and more information on paddling around Bostwick Island, and other interesting islands in the area. Also, see below for a paddling navigation map. Use this navigation map to find your way to Half Moon Bay at Bostwick Island. 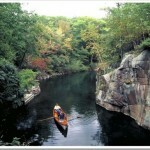 The best paddling launch points are Rotary Beach and 1000 Islands Kayaking. After navigating the waters to Half Moon Bay, you can enjoy Sunday worship service in the summer at 4:00pm. Hymn books are passed out, and guests are invited to sing along with hymns, listen to guest speakers, and participate in ecumenial service. Bostwick Island is privately owned, aside from Half Moon Bay. Feel free to explore the bay area, but please respect the land and privacy of landowners on other parts of the island. 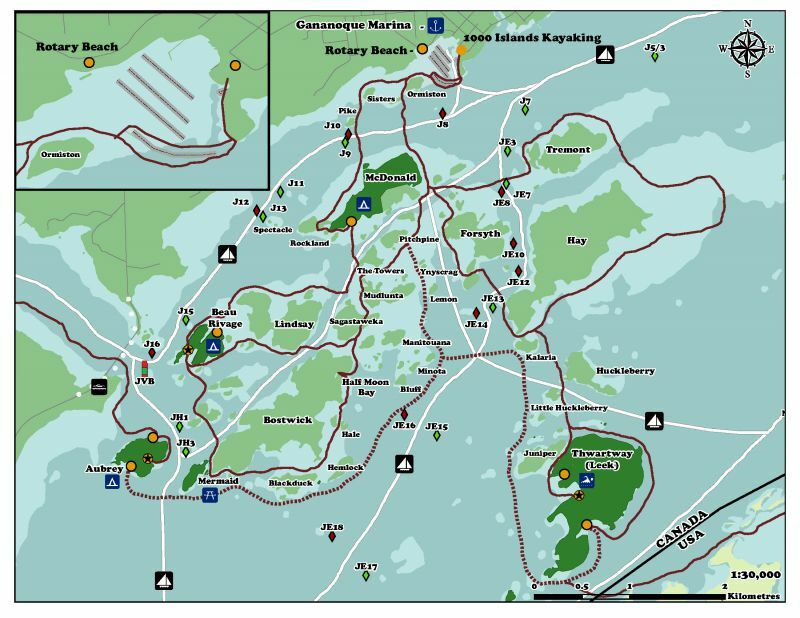 Washrooms, campsites, and docking facilities are located nearby on Aubrey Island and Beau Rivage Island, which are part of Thousand Islands National Park of Canada.